The Center for Excellence in Education (CEE) was founded in 1983 by the late Admiral H. G. Rickover, Father of the nuclear navy and of civilian uses of nuclear power, and Joann P. DiGennaro, CEE’s President. They recognized that nurturing careers of excellence and leadership in science and technology in young scholars was an essential investment in the United States national and global future. The Center’s programs help keep the United States competitive in science and technology and further international collaboration among leaders of the world. CEE challenges students and assists them on a long-term basis to become the creators, inventors, scientists, and leaders of the 21st century. Funding for the Center for Excellence in Education began with $250 received by Admiral Rickover for a university lecture. The Admiral and Ms. DiGennaro met with educators around the world to create a unique educational experience for students of science, technology, engineering, and math (STEM). The Research Science Institute (RSI) was launched in 1984. The program is collaboratively sponsored with MIT. In 2002, CEE launched the USA Biology Olympiad, the premier competition in biology for high school students. While the USA has for many years participated in academic Olympiads in mathematics, physics, chemistry, and computer science, the 2003 International Biology Olympiad (IBO) was the first time the U.S. fielded a national team at this level of competition. The Center’s Teacher Enrichment Program (TEP) helps to assure a future talented and diverse U.S. workforce in science, technology, engineering, and mathematics (STEM). It focuses on best practices and resources as well as exposure to the breadth and depth of scientific discovery often not available to rural and urban high school teachers and their students. RSI, USABO and TEP are free of cost to all participating scholars. To most people, Admiral H.G. Rickover is best known as the father of the nuclear navy, but to anyone involved with CEE's programs, Admiral Rickover is the father of the Research Science Institute (RSI), the nation's premier science and mathematics program. The late Admiral H.G. Rickover emigrated from Poland to the US in 1900. He received his Engineering degree from the U.S. Naval Academy in 1922. Following sea duty, Rickover earned a master of science degree in electrical engineering from Columbia University. He served in the Bureau of Ships during World War II. After the war, he was assigned to the Manhattan Project at Oak Ridge, Tenn. and later served with the U.S. Atomic Energy Commission. As Director of the Naval Reactor's branch of the U.S. Navy, the Admiral developed the world’s first nuclear-powered submarine, the USS Nautilus, launched in 1955. In addition to establishing his own graduate schools for nuclear engineering studies and writing several books on education, the Admiral was awarded the Congressional Medal for exceptional public service in 1959 and 1983, and in 1980 was presented the Presidential Medal of Freedom by President Jimmy Carter for his contributions for world peace. His record of 64 years of active military service remains unchallenged. The Admiral passed away in 1986; he is remembered as a renaissance scholar, an intensely principled leader, and a fierce believer in a better world through education. RSI students have come to be called "Rickoids," and the program continues to be influenced by his vision. About Joann P. DiGennaro, Esq. 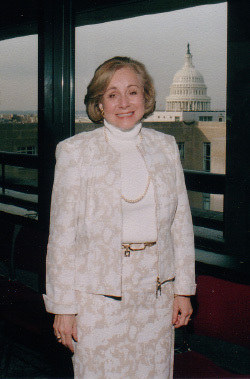 Joann DiGennaro established the Center for Excellence in Education (CEE) with the late Admiral H.G. Rickover in 1983 to nurture high school and university scholars to careers of excellence and leadership in science, technology, engineering, and math (STEM), and to promote collaboration among scientific and technological leaders in the global community. She is affectionately referred to as “Mrs. D.” by the Rickoids. Ms. DiGennaro is responsible for all international and cultural exchanges of talented math and science students between the Center and other nations. She has negotiated educational science programs with 50 nations to date. She is nationally and internationally recognized as a champion for STEM education. President George W. Bush appointed Ms. DiGennaro to the U.S. Army War College Board of Trustees. She served as Chairperson of that Board. Ms. DiGennaro was also appointed to the Advisory Council (the Board) of the National Aeronautics and Space Administration (NASA). She is on the Board of Governors of the Coordinating Council for International Universities, and was a Research Affiliate at Harvard University. Ms. DiGennaro serves on the Board of the State Council for Higher Education in Virginia (SCHEV) and the Commission of Higher Education Reform, Innovation and Investment appointed by Governor Bob McDonnell. Joann was named by U.S. News and STEMConnector as one of 100 Top U.S. Women Leaders in STEM. Ms. DiGennaro received her BS Degree from Purdue University and her MS from the University of Maryland. She read the law at Oxford University and received her Juris Doctorate Degree from George Mason University. She is the author of Scholarships and Fellowships for Math and Science Students, and her most recent book was published through Harvard University’s Program for Information Policy Studies in January 2005, Science Literacy: Essential for Decision Making.